Love that dsp, and the one little snowflake in a different color really makes the image pop! Great Job, Holly!!! 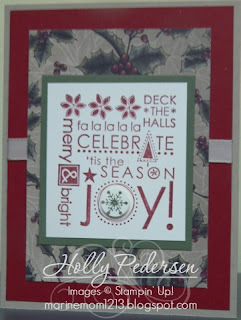 Love the paper and I agree the snowflake poped like that is a great touch. These colors are so fab together. That DSP is just to die for!!! I love the little popped up snowflake!!! Cute way to pop up the snowflake! Absolutely adorable! Amazing use of the DSP ~ Wonderful job! Too fun!!! Thanks for playing along! !